Does the wood flooring in your home have a history? Reclaimed wood flooring adds not only a tasteful, seasoned appearance to your interior, it can add a sense of heritage — one that dates back further than newly-cut wood purchased at the local big-box home center. Wood utilized for flooring may be recycled from demolition of antique homes, factories and barns. In the past, wood was the primary construction material in these structures and plentiful amounts can be reclaimed when they are razed. Such wood used to be dumped into the local landfill. However, today’s increased consciousness for recycling as well as the consumer preference for a more classic, aged appearance in woodwork has led to a growing industry of wood reclamation. Rather than bulldozed, these days antique structures may be carefully dismantled, literally one nail at a time, to salvage reusable wood. Reclaimed wood flooring may indeed be well-aged: The majority of reclaimed wood marketed today comes from structures built between 1840 and 1940. Wood building materials from that era were often derived from old growth timber in forests which had never been cut. The trees utilized may have been hundreds of years old. It’s not inconceivable that a reclaimed wood floor installed today may have been originally produced from trees standing as far back as the American Revolution. Today, such trees are generally protected by environmental regulations and cannot be harvested. Some reclaimed wood flooring on the market today, such as American Chestnut, is not even available anymore as newly-cut wood because the tree is nearly extinct. 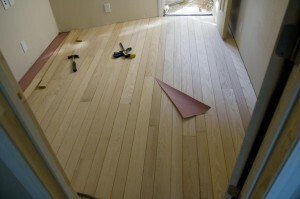 Old-growth wood flooring differs greatly from recently harvested new-growth wood. The grain pattern is much denser and tighter and displays a richer patina when properly finished. Reclaimed wood also shows “character”: Nail holes, knots and wear patterns are common and add to the historic heritage of the floor. However, all reclaimed wood flooring is hand-picked and graded to eliminate damaged or unsuitable material. Wood species that are typically reclaimed for flooring include antique chestnut, heart pine, oak, maple, fir and a variety of tropical hardwoods. Because of the amount of labor involved in reclaiming and re-milling used wood flooring, prices are generally higher than typical new wood, which has an average cost of $3.00 to $12.00 per square foot. Costs of reclaimed wood flooring usually range from a low of $4.00 to as much as $30 per square foot. The supply of a particular type of wood from a specific demolition project may be limited. Consumers should keep this in mind and be sure to purchase sufficient amounts while it is available to ensure completion of the floor, plus some extra to keep on hand for future repairs or adjustments.